You’ve considered Blu-ray enough to know that it’s your best bet for secure record keeping and archiving, but we’d like to remind you what it can do for your media. You know a Blu-ray drive can play Blu-ray discs, but don’t forget that an optical drive can also play CDs, DVDs too. Your older library is not left behind. Why would you want a Blu-ray Disc drive for your PC or Mac? One word: space. A single layer of a Blu-ray Disc holds the equivalent of 35 CDs or five DVDs. A Blu-ray might look like a DVD, but because it utilizes a shorter wavelength and a narrower laser beam spot, it can hold a greater capacity. The laser is blue by the way, but you guessed that. A recordable Blu-ray disc (BD-R) can hold 25GB per layer, with dual-layer discs holding 50GB. BDXL discs that can hold 100GB of data are available for those with the need of all that data in one single disc. With standard storage care, a BD-R should last a lifetime. Hard disks are far more likely to fail, making recordable Blu-ray a strong primary or even secondary alternative for backing up, and a primary solution for long term archive. What do Comcast data caps mean for larger file needs? 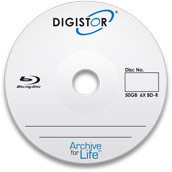 This entry was posted in Blu-ray Recordable Media, Digistor Data Storage with Blu-ray Drives and Recordable Media, Optical Drives, Optical Media by DIGISTOR. Bookmark the permalink.